Hundreds of new alien species have been encountered in the coastal environments of the Mediterranean Sea in recent decades, including the poisonous pufferfish Lagocephalus sceleratus. This invasive fish is native to the Pacific and Indian Ocean, and to the Red Sea, from where it likely migrated via the Suez Canal and rapidly invaded the Eastern Mediterranean Sea, reaching the western part of the basin. One of the issues with this fish is that it contains tetrodotoxin, a neurotoxin that can prove deadly to humans and for which there is no known antidote. Besides being poisonous, the pufferfish is also strong and has strong teeth that allow it to cut fishing nets. Today this pufferfish represents 4% of the weight of total artisan catches in the Eastern Mediterranean Sea and is becoming a threat. Generally, it’s more and more evident that the invasion of this pufferfish is wreaking huge damage to the Mediterranean marine ecosystems, to people health, and also to fisheries. But what science can do to monitor and react to this phenomenon? The H2020 BlueBRIDGE project (www.bluebridge-vres.eu) has used data mining techniques to estimate the spread of this pufferfish in the Mediterranean Sea and to develop a general purpose approach, which can also be applied to other species. Figure. Potential distribution map of Lagocephalus sceleratus overlapped to known locations of this fish. Colours represent the probability of the fish to be at a certain (.5°) location in the near future. BlueBRIDGE merged 7 machine learning models to produce this near-future map of the distribution of Lagocephalus sceleratus. This model was assessed with respect to independent observations and expert opinion in the Mediterranean Sea. Potential impact of the invasion on FAO Areas, EEZs, and GSAs were estimated as the density of high impact locations (at .5° resolution) falling in the areas. Figure. (a) Presence (brighter points) and pseudo-absence (darker points) locations of L. sceleratus in its known inhabited/native environment, used to train the models. 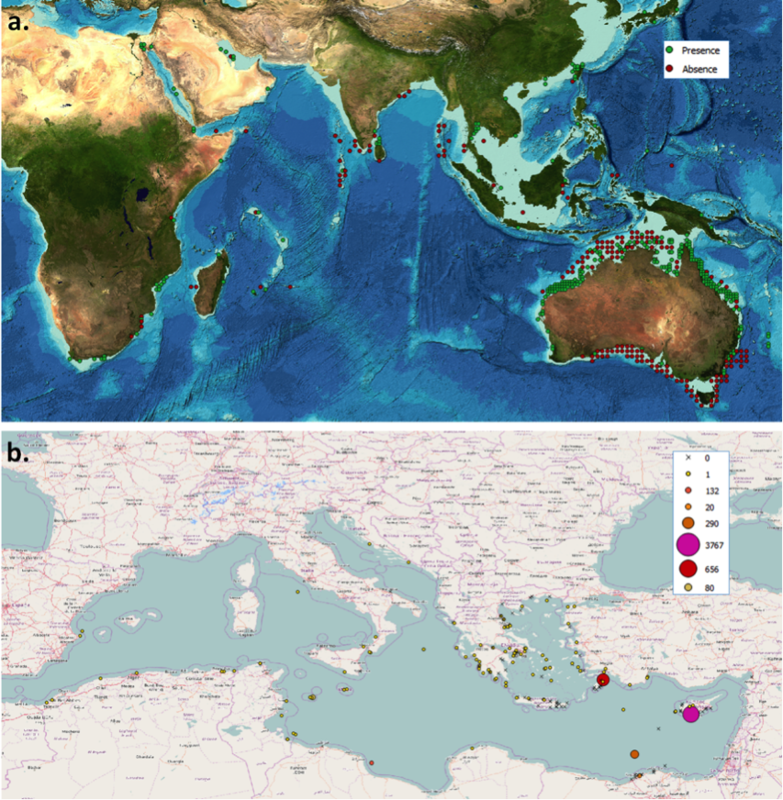 (b) Expert-reported observation records in the Mediterranean Sea collected from published articles, grey literature, and from the GBIF data and OBIS providers. Figure. 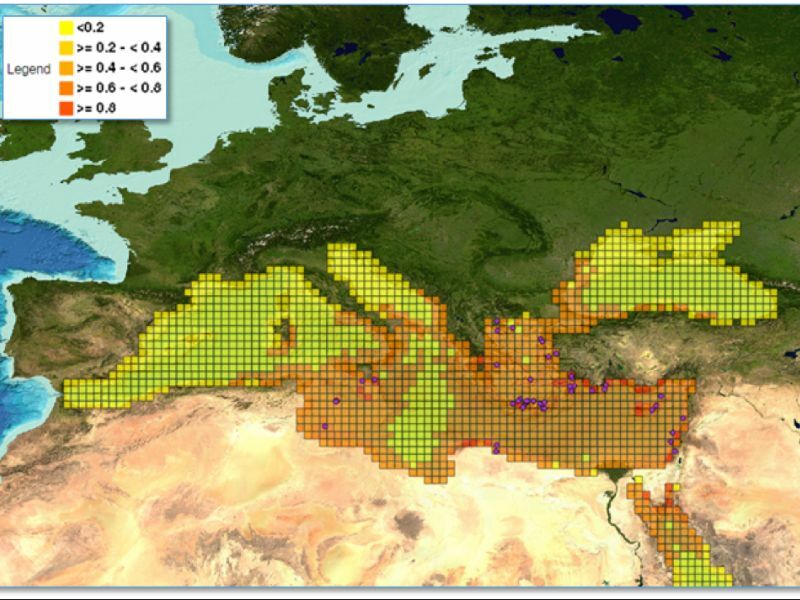 Impact indicator calculated as the density of sensibly non-zero probability locations in the pufferfish distribution on different subdivisions of the Mediterranean Sea: (a) FAO major fishing areas, (b) Exclusive Economic Zones, (c) general subdivisions of the General Fisheries Commission. 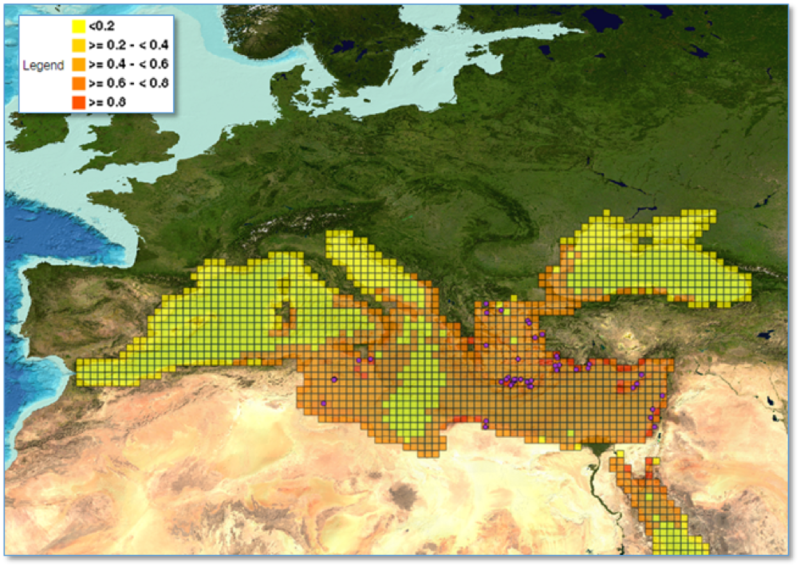 To obtain these results, BlueBRIDGE leveraged the D4Science hybrid data e-Infrastructure (d4science.org), which was used to train statistical models, to quickly combine environmental data with observations of the species worldwide, and then to project the combined model onto the Mediterranean Sea. The approach used is completely Open Science compliant, as each step of the workflow is published as-a-Service and it is reproducible, repeatable, and reusable for experiments on other invasive species. A related scientific paper has been submitted to the Ecological Modelling Journal (Elsevier) and the work was also presented at the “Expert meeting on climate change implications for Mediterranean and Black Sea fisheries” of the FAO General Fisheries Commission for the Mediterranean Sea (4-6 Dec. 2017), and will be included in the final report of the meeting.